A recent San Diego story presents a complicated issue for those affected by Los Angeles DUI laws. Melissa Tennent, daughter of Arthur Jacobs, recently became distraught when she discovered the woman responsible for her father’s death had left prison three years and eleven months early. 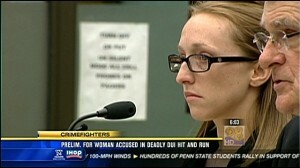 Julianne Thompson, 25, struck and killed Jacobs on July 27, 2011, while driving under the influence in Carlsbad. After hitting Jacobs, Thompson abandoned her vehicle and hid in nearby bushes before police located and arrested her. She pled guilty to gross vehicular manslaughter and intoxicated hit-and-run charges. Upon receiving a guilty verdict, Thompson began serving a six-year sentence in prison. However, Tennent recently ran into Thompson in a local grocery store – just two years after Thompson was sent to prison. Although she expressed dismay over this unexpected encounter, early releases for such offenses happen fairly often in the state. Currently, California law does not classify the hit-and-run and vehicular manslaughter charges for which Thompson was convicted as “serious” or “violent” offenses, which means displaying good behavior – as Thompson did – typically reduces the length of a prisoner’s sentence. Gross vehicular manslaughter, while a lesser charge than vehicular homicide or second-degree murder, still represents a serious offense under California law. The penalty for DUI driving that kills another individual can lead to prison sentences of up to ten years, to say nothing of the devastation it causes to the victims’ families. Thompson has legally served her time and now has the opportunity to rebuild her life, but the repercussions of her actions will stay with her for many years to come. DUI driving that causes the death or injury of another individual is a tragedy for everyone involved. Those facing such charges should not do it alone. With the help of a Los Angeles DUI attorney, such as Michael Kraut, you can present a legal defense that addresses all the circumstances surrounding your accident. Contact the Kraut Law Group today to discuss your case.